Ray Nagin’s all “we’re oscar mike on the Chocolate City” New Orleans. Today, super mayor Ray Nagin told everyone to “get your butts moving out of New Orleans.” Then he added that he’d stay behind in the NO (aka Chocolate City) and keep things chill because that’s how he rolls. 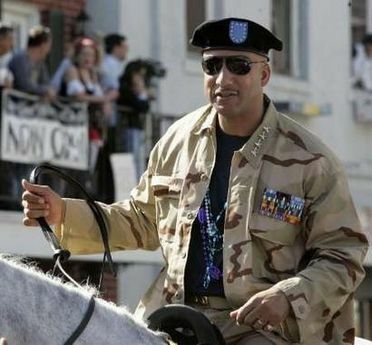 General Ray Nagin. Get some! We're 'oscar mike!'. And Michael Moore’s God loves hurricanes and so answered his prayers this weekend and Hurricane Gustav is bearing down on the gulf states and the upcoming Republican Convention (check your local listings – it might be covered). Moore can put away his Viagra because this hurricane and upcoming convention is probably already getting him harder than a Cindy McCain-owned diamond. Gross, I know, and I apologize for the imagery. < Previous Joe Biden Counters Sarah Palin choice with New Makeover!